Elvis Presley died in his Memphis mansion on 16 August 1977, at the age of 42. The iconic status he achieved in his lifetime coupled with a sudden and relatively early death cemented his position as one of the most famous rock stars ever. Most people love a conspiracy theory, and the undisputed king of rock'n'roll has been the subject of more than a few, many of them variations on the theme of his faked death and continuing incognito existence. But even if the music legend is not actually with us in the flesh and blood, his spirit still lives in his music - and the lucrative impersonation industry. My sister and I are Elvis fans, I was returning from a night-fishing trip on August 16th 1977, in my dad's car. It was around 0600 when I turned the radio on to hear Elvis on Radio Luxemburg the DJ was in tears as he re-stated the news that Elvis had died. As soon as I got home I awoke my sister to tell her. We spent the rest of the day glued to the radio and television. All night vigils and movie shows followed then and now, and our love for the man has grown every day since. We were 14 and 16 then. In 2003 my sister and I went on a pilgrimage to Graceland. For those of you who have not been, go. It has changed my life. To be so close to the man and his music cannot be bettered. We are planning to return next year. There is and will always be only one Elvis. Like all great figures in history the legend will never die and his legacy will be there for generations to come. I was 12 when Elvis Presley died, and had been a fan since 1969. Like many others, I was on holiday at the time. On Monday August 15th, I went into a shop to get a T-shirt printed with Elvis' photo on it. The shop also printed wording on T-shirts, so I asked for ELVIS to be printed above the photo. The man in the shop teased me by asking how to spell the name, and asked who this Elvis was. I did not realise at the time that he was joking, and I replied in all seriousness. I never met that man again, and have always wondered what he felt when he heard the news of Elvis' death just the following day. Having just landed at Heathrow, I was in the unusually long queue at immigration, when the pretty blonde in front suddenly burst out sobbing: "He was all that mattered to me". Young and newly single myself, I concluded that she had split up with her boyfriend, and to my surprise, found myself placing a reassuring arm around her shoulder and saying: "I know just how you feel", placing the necessary emphasis on 'just', which, according to my ex, is guaranteed to work in these circumstances. How I wished the queue were longer! She looked up, smiled gratefully and managed a few words between sobs, which, it seemed to me, grew increasingly intimate as we approached the barrier. "Men just don't understand, do they? I don't mean you, you are so sweet." A few more minutes, and I would have seized her in my arms and kissed the tears off those limpid blue eyes. If only I could lay my hands on the villain. Then she said: "Love me tender" is my favourite, I never tire of watching it, but my husband hates it. Ah, there he is... What's your favourite?... Why, what's wrong?" A few sniggers from the schoolgirls returning from their skiing holiday, and I knew my embarrassment had not gone unnoticed. Even after all these years, whenever Elvis is mentioned, I wonder what became of that girl with the saucer-eyes who so earnestly looked up at me. Maybe she will see this story and respond! I was eight and on holiday with my family at the time. My sister and I had been to get the morning paper and I didn't know why she was crying (I hadn't seen the headline). When I realised, I was upset and cried too. I loved Elvis' music, and still do. What a waste of talent. I was 14 when he died. That morning I had been listening to a tape of him in bed and for some unknown reason, I started to cry, a real heart-breaking cry. Mum came in a few minutes later and said "Oh God, you know - how did you find out?" I was hysterical afterwards. My best friend was Jackie who lived next door, we were both ardent Elvis fans and our parents would not let us see each other in case we did something stupid! Years afterwards, they told us that they thought that we might commit suicide because we were so upset. I wear a black armband on the 16th of August each year to remember him. I remember vividly as a boy of 14 hearing of his death on the 11.00pm news on Radio Luxembourg. It was just one of those moments in time that will stay with me forever. I remember the day Elvis died quite well. I was only seven-years-old and sitting down watching the TV when my mother came home from work that afternoon and rushed in and told me to quickly change the channel and put on the news. I looked at her asking why and she said that Elvis had died. So we turned on the news and watched the stories of Elvis and how he passed away. Being only seven-years-old I really didn't understand the impact his death made to the world but I do remember my mum crying as she sat and watched the news. That was the first time I had ever seen my mother cry. Gone, but never forgotten, I have grown up listening to Elvis and my children will grow up listening to Elvis. His voice and persona made him the greatest entertainer the world has, and will ever see. His voice was truly unique and will never be equalled. He was, he is and forever will be The King of Rock and Roll! When he died I was a 10-year-old girl still at school. I've always been a fan of Elvis and I'm wearing an Elvis tie and will play his music all day long. He may have died but the King lives on in my life. He was the best singer for all age groups and I loved the way he moved. Long live the King. I remember it very well... by second born was just five months old. My mother often told of scandalizing my paternal grandmother by dancing about as a pregnant teenager to the songs of Elvis and it was often said in the family that my reckless regard for convention and conformity was attributable to my mother listening to Elvis while she was pregnant. I was born to rock'n'roll and Elvis was King... he was king not because of a royal lineage but because he was born so poor to the depression and went on to capture the hearts and spirits of nations... especially this nation. No one was like him, though there will be earnest imitators for years and years to come. His death was more relevant, poignant, and heart-felt than the deaths of presidents who had gone before or since. He was the first American King... and will be remembered as such for as long as America has history. long Live the King! I had just returned to my hotel (in Doha, Qatar) for my lunch. I went to my room to shower and to tune in to the BBC world news. That's when I heard the words "The King is dead". In the split seconds before his name was mentioned I was trying to think of a country with a "King" in power. Then the story broke and I was in shock. 8 January is his birthday and mine too. I just felt that a little part of me died as well. For me Elvis has always been part of my life as long as I recall. My family left Chile in 1973 and came to Canada. My father and mother told me how some of their special moments always had an Elvis connection: first time they danced to rock'n'roll it was an Elvis song "Jailhouse Rock". The first time they kissed was "Kiss me tender" and when they got married the band played some Chilean traditional music, but they mostly played Elvis songs. My father died seven years ago, the same day Elvis died. We took some of his ashes to his homeland and some to Elvis's grave. Hopefully he's watching the King in heaven! I've been an Elvis fan since I was eight (now I'm 21) and now I must say, "It's cool to be an Elvis fan". I came to London to see "Elvis The Concert" at Wembley Arena in 2000. After 24 years I saw that Elvis is still able to hold a sell-out show. He's timeless and he'll always be no matter what. I love you Elvis... With all my heart. I was brought up on Elvis Presley's music in our household. 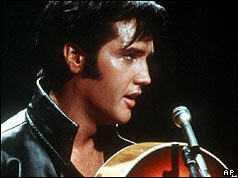 When he died i was 10-years-old, so I remember watching Elvis on tour live via satellite - what a performer. Now I'm 36, Elvis still lives on through his music. God bless the man who invented rock'n'roll, may he live forever in our hearts, thanks for the music Elvis. Twenty-six years after his sad passing, and still as popular, if not more popular, the legacy of the king still lives on. What talent he has to continue to be one of the most famous celebrities that has ever lived, and still be known by his first name alone, across the globe. Long live the king! I was one-year-old when Elvis died, so I never had the privilege of seeing him live, although I did see Elvis The Concert earlier this year, which was amazing. As with most geniuses, Elvis was a troubled soul, but he brought so much happiness and joy to the world that he will live on forever. He was a remarkable man, talented and beautiful, and I will love him forever. Elvis sang to entertain and please his fellow man, not concerned about nationality or colour. His courage and charisma, his talent and good looks were all matched by his wonderful humanity, no other entertainer commands such worldwide respect because none have reached the level of giving he gave in his life. I hear his voice and my troubles are gone, he never fails to make me feel good about being alive. Long live the King! Long live the King, 16 August 1977. This was our second wedding anniversary. As Elvis fans it's easy to count the years since his death. I had worked a night shift on 15 August and my wife woke me up to tell me the news. I stayed awake and we played Elvis records as we listened to the news throughout the day. I was surprised that more wasn't done last year on his 25th anniversary. I have never seen a better film, acting, etc. than Mr Presley's Jailhouse Rock. His acting ability reminded me of James Dean and Marlon Brando. The entire film is so great that I am reminded of Van Gogh.